German occupation of Warsaw until 1945. It began with huge aerial bombardments initiated by the Luftwaffe starting on September 1, 1939 following the Nazi invasion of Poland. Land fighting started on September 8, when the first German armored units reached the Wola district and south-western suburbs of the city. Despite German radio broadcasts claiming to have captured Warsaw, the initial enemy attack was repelled and soon afterwards Warsaw was placed under siege. The siege lasted until September 28, when the Polish garrison, commanded under General Walerian Czuma, officially capitulated. The following day approximately 140,000 Polish troops left the city and were taken as prisoners of war. On October 1 the Wehrmacht entered Warsaw, which started a period of German occupation that lasted until the devastating Warsaw Uprising and later until January 17, 1945, when the city was liberated by Soviet forces. 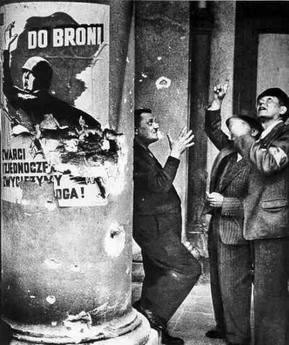 Under the international rules regarding aerial warfare in 1939 Warsaw was considered a legitimate military target as the city was on the front line during the fighting and it was heavily defended by the Polish army. From the very first hours of World War II, Warsaw, the capital of Poland, was a target of an unrestricted aerial bombardment campaign initiated by the German Luftwaffe, which was controlled by Hermann Göring. Apart from the military facilities such as infantry barracks and the Okęcie airport and aircraft factory, the German pilots also targeted civilian facilities such as water works, hospitals, market places and schools, which resulted in heavy human casualties that possibly led to the early surrender by lowering of morale of the Polish army defending the city. The anti-aircraft defence of the capital was divided into active and passive parts. The former was composed mostly of units of the Pursuit Brigade (Brygada Pościgowa) under Colonel Stefan Pawlikowski, and anti-aircraft artillery and anti-aircraft machine guns detachments under Colonel Kazimierz Baran. The Pursuit Brigade was equipped with 54 fighter aircraft, mostly the obsolete PZL P.7 and PZL P.11 types. The AA artillery had 86 pieces of anti-aircraft artillery, as well as an unknown number of other anti-aircraft machine guns. The latter was composed mostly of fire-fighter brigades and volunteers and was supervised by Colonel Tadeusz Bogdanowicz and Julian Kulski, the deputy president of Warsaw. Initially the air defence of Warsaw was fairly successful and by September 6, 1939, the Pursuit Brigade had shot down 43 enemy aircraft, while anti-aircraft artillery had shot down a similar number of enemy bombers. There were also 9 unconfirmed victories and 20 damaged enemy planes. However, the brigade also suffered heavy losses, and by September 7 it had lost over 38 pieces of equipment, or approximately 70% of its initial strength, which greatly contributed to an early surrender. The AA defence started to crumble when on September 5 by order of the military authorities 11 AA batteries were withdrawn from Warsaw towards the eastern cities of Lublin, Brześć and Lwów. Furthermore, as the war progressed, the German high command redirected more bombers to attack the city, especially the historical old town, the Warsaw Royal Castle and other iconic monuments, significant to the Polish nation and its capital. At the peak of the initial bombing campaign on September 10, there were more than 70 German bombers above Warsaw. During that day, nicknamed "Bloody Sunday", there were 17 consecutive bombing raids. On September 3, the forces of German 4th Panzer Division under Major General Georg-Hans Reinhardt managed to break through positions of the Polish Łódź Army near Częstochowa and started their march towards the river Vistula and Warsaw. The same day Polish Commander in Chief, Marshal of Poland Edward Rydz-Śmigły ordered the creation of an improvised Command of the Defence of Warsaw (Dowództwo Obrony Warszawy). General Walerian Czuma, the head of the Border Guard (Straż Graniczna), became its commander and Colonel Tadeusz Tomaszewski its Chief of Staff. Initially the forces under the command of General Czuma were very limited. Most of the city authorities withdrew together with a large part of the police forces, fire fighters and the military garrison. Warsaw was left with only four battalions of infantry and one battery of artillery. Also, the spokesman of the garrison of Warsaw issued a communique in which he ordered all young men to leave Warsaw. To coordinate civilian efforts and counter the panic that started in Warsaw, Czuma appointed the president of Warsaw Stefan Starzyński as the Civilian Commissar of Warsaw. Starzyński started to organize the Civil Guard to replace the evacuated police forces and the fire fighters. He also ordered all members of the city's administration to return to their posts. In his daily radio releases he asked all civilians to construct barricades and anti-tank barriers on the streets and at the outskirts of Warsaw. On September 7 the 40th Infantry Regiment "Children of Lwów" (commanded by Lt.Col. Józef Kalandyk) – transiting through Warsaw towards previously assigned positions with the Army Pomorze – was stopped and joined the defense of Warsaw. The position of Polish and German forces during the siege. One of the barricades erected at the crossing of Opaczewska and Grójecka streets was defended by the 4th company of the 40th "Children of Lwów" Regiment. After the war a monument was built on the spot to commemorate the battle. On several occasions lack of armament had to be made up for by ingenuity. One of the streets leading towards the city center was covered with turpentine from a nearby factory. When the German tanks approached, the liquid was ignited and the tanks were destroyed without a single shot fired. The German forces suffered heavy casualties and had to retreat westward to help thwart the Bzura River counter-offensive. The 4th Panzer Division alone lost approximately 80 tanks out of the approximately 220 that took part in the assault. By then General Czuma had gathered an equivalent of 2 infantry divisions under his command. His forces were supported by 64 pieces of artillery and 33 tanks (27 of Vickers E, 7-TP and R-35 and 6 TK-3 and TKS tankettes). On September 8 the Commander-in-Chief, Marshal Edward Rydz-Śmigły ordered the creation of an improvised Warsaw Army (Armia Warszawa) under General Juliusz Rómmel. The newly created force was composed of the forces defending Warsaw and Modlin Fortress, as well as all Polish units defending the Narew and the Vistula between Warsaw and Pilica river lines. General Czuma continued to be the commander of the Warsaw Defence Force, which he split into two sectors: East (Praga district) under Lt.Col. Julian Janowski and West under Colonel Marian Porwit. The Army Poznań commanded by General Tadeusz Kutrzeba, and Army Pomorze under General Władysław Bortnowski started an offensive on the left flank of the German forces advancing towards Warsaw. As a result of this offensive that later became known as the Battle of Bzura, German commanders withdrew the 4th Panzer Division and sent it to counter the Polish threat near Kutno. Its positions were replaced by forces of a weakened German 31st Infantry Division. In this sense the desperate attempt to buy time for organising a defence of Warsaw was a success. The defenders of the city were joined by various units of the routed Prusy Army. In addition, several new units were created in Warsaw out of reserve centres of Warsaw-based 8th Polish Infantry Division and 36th "Academic Legion" Infantry Regiment. On September 11 the Polish Commander in Chief ordered that Warsaw was to be defended at all costs, despite the possible heavy casualties and civilian losses. The following day the forces of German 3rd Army (under General Georg von Küchler) broke through Polish lines along the Narew river and started its march southwards to cut off Warsaw from the east. It was assaulted by cavalry units under Władysław Anders, but after heavy fighting the Polish counter-offensive failed and the forces were withdrawn to the south. Other Polish units fighting under General Juliusz Zulauf near the Narew River area retreated and reached Warsaw on September 14. They were incorporated as the core of the defence forces of the borough of Praga district. On September 15 the German forces reached Warsaw from the east and the capital of Poland was under siege. Only a strip of land along the Vistula leading towards the Kampinos Forest and Modlin Fortress was still controlled by Polish forces. The defence of the Modlin fortress was an important relief to the defenders of Warsaw. After heavy fighting for the Grochów area the German 23rd Infantry Regiment was annihilated by the Polish defenders of the 21st "Children of Warsaw" Infantry Regiment under colonel (later promoted to general) Stanisław Sosabowski. "Fall of Warsaw" redirects here. The water works were destroyed by German bombers and all boroughs of Warsaw experienced a lack of both potable water and water with which to extinguish the fires caused by the constant bombardment. Also, the strategic situation became very difficult. The Soviet Union's entry into the war and lack of support from the Western Allies made the defence of the city pointless and heavily demotivated the volunteers in participating in any further military actions. On September 26, Army Warsaw General Juliusz Rómmel, started capitulation talks with the German commander. On September 27, at 12:00 a cease fire agreement was signed and all fighting halted. :78 Soon afterwards, Warsaw capitulated. Several units declined to put down their weapons and cease fire, and their commanding officers had to be visited by generals Czuma and Rómmel personally. On September 29, the garrison of Warsaw started to hide or destroy their heavy armament. Some of the hidden war material was later used during the Warsaw Uprising. On September 30, the evacuation of Polish forces to German prisoner of war camps started and, the following day, German units entered the capital. Adolf Hitler, Walter von Reichenau, Erwin Rommel and Martin Bormann observing the siege of Warsaw. Starving citizens taking meat from the remains of dead horses on Nowy Świat Street near the intersection with Staszic Palace. Burning Warsaw Royal Castle in September 1939. The air strikes caused by the Luftwaffe destroyed many significant monuments and structures. Graves of soldiers on Three Crosses Square that perished during the siege and had to be immediately buried to prevent the spreading of diseases. Tombstones of Polish Jews who fell during the Siege of Warsaw in 1939 among their gentile colleagues. Graves of Polish soldiers who fell in the Polish Defensive War of 1939. General Walerian Czuma's appeal to the inhabitants of Warsaw. The text reads – "Citizens! Warsaw must be defended!". Norbert Konwinski (1978) – The Mayor: Saga of Stefan Starzynski. Claremont: Diversified Enterprises. ISBN 0-9601790-0-3. Wikimedia Commons has media related to Siege of Warsaw (1939).